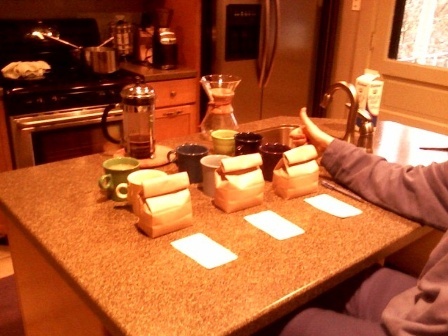 This photo was sent to us by a Tazza D’Oro customer with the caption : “Tasting commences”! The coffees on the table were Nicaragua Esperenza, Panama Esmeralda and Panama Volcancito. The really rad piece of this is our customer’s cupping notes were point on with ours and more. In fact, I went back and re-cupped the Esperanza because I missed a few points about the coffee. Notice the French Press and Chemex – what coffee shop owner wouldn’t be doing cart-wheels over this? Thumbs up, dudes!